Visitors and expats enjoy Vientiane for its laid back, bor pen yang vibe and shabby-chic charm. Vientiane likely won’t blow you away with stunning architecture, historical sites, or state of the art infrastructure. But that doesn’t mean there isn’t lots to love about this unassuming capital city on the Mekong, and day trips from Vientiane are no exception. If this is your first time in Southeast Asia and you’re planning a whirlwind tour of the top sights with limited time, lingering in Vientiane might disappoint with the wrong mindset. For both the intrepid and casual traveler who are willing to throw off the unreasonable demands of modern travel, build some real flexibility into their schedule, and dig a little deeper, Vientiane and even its surroundings areas are ready to surprise and delight. Still, even among the expat community here in Vientiane, there is a general sense that there isn’t much to see and do a short distance from town, and worthwhile day trips from Vientiane are few and far between. With a set of wheels and/or time and patience, we say there’s plenty to do within a short distance of town! 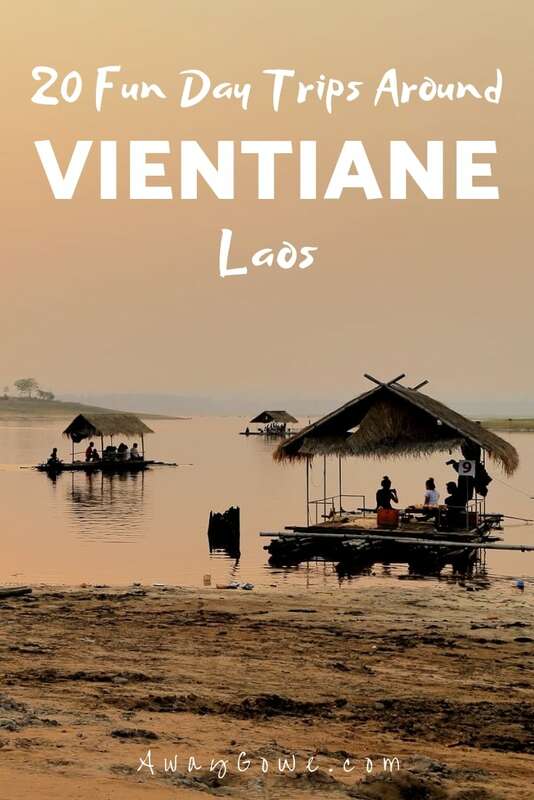 Don’t miss our Vientiane Travel Guide. We’ve put together a list of fun things to do within a 90 minute drive of Vientiane. You’ll want to keep in mind that 90 minutes travel time in Laos means something very different than other places with more developed infrastructure. What is the maximum distance you can reasonably expect to cover in 90 minutes? Generally, about 40 miles (70km). In the rainy season (May-October), expect road journeys to take even longer. Plan accordingly! Also, be sure to take a look at our transport tips for day trips at the end of this post. Day Trips from Vientiane: Exploring weird and wonderful Buddha Park. We’ve written a lot about Vientiane’s venerable Buddha Park over the years, and for good reason! It’s a unique place you simply won’t find anywhere else (well…except for the other Buddha Park across the river in Thailand). Buddha Park is weird, spiritual, terrifying, uplifting, and so much more! Where else can you crawl into a four-story giant pumpkin? 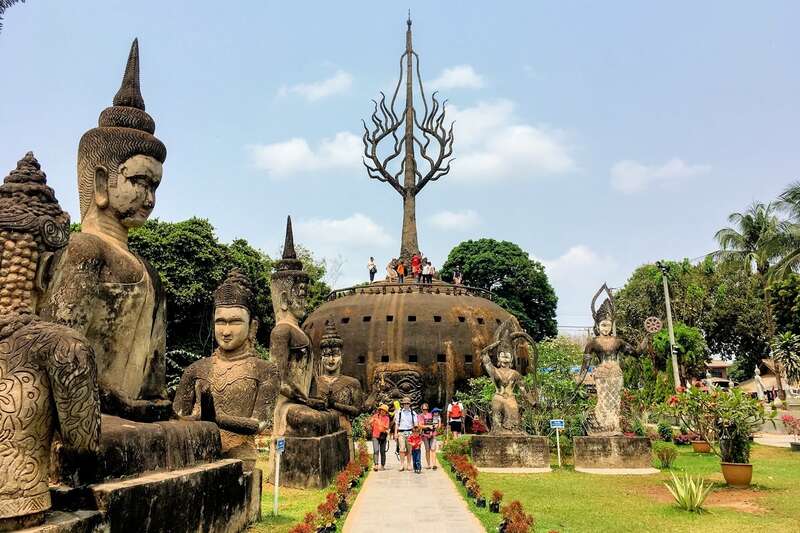 Time Commitment: 40-60 minute journey from Nam Phou fountain in the direction of the Lao-Thai Friendship Bridge (public transport is available); 30-60 minutes exploring Buddha Park, more time if you opt for lunch at their excellent on-site Lao restaurant. Nearby Attractions: Inpeng Culture Park (water park, see below); Lao Disabled Women’s Development Centre (local handicrafts, learning); Thai-Lao Friendship Bridge (convenient for those heading on to Thailand). ☞ Read our helpful article, Buddha Park: The Hidden Gem of Greater Vientiane, including tips on getting there! Vientiane Day Trip: Local lunch on the water. Another quintessential Lao experience in Vientiane, having lunch on a thatch-covered boat motoring slowly down the river. These days, you’ll be hard pressed to find this experience on the Mekong. Most locals will tell you to head north out of town to the community of Tha Ngon, distinguished by its aging steel bridge over the picturesque Nam Ngum river. From the bridge, you can’t NOT spot the floating restaurants, as they are everywhere! Time Commitment: About an hour drive (50km) from the city center (Nam Phou fountain), straight up Route 10; 30 minutes to two hours at Tha Ngon, depending on how long you opt to stay on the water. Nearby Attractions: Tad Xangthevada waterfall/ river complex (see below) and Na Deer Park; Also on the way to Lao Zoo (see below) and points north (e.g. Vang Vieng), or Laodi distillery with a little backtracking (see below). ☞ Read more in our article, Floating Lunch. Day Trips from Vientiane: Discovering Laos’ wildlife rescue center. Many Laotians and long-time residents maintain that the Lao Zoo has seen better days. But the zoo (now the Laos Wildlife Rescue Center, though the signage still says “Lao Zoo”) is still very much worth a visit. It’s definitely one of the longer day trips out of Vientiane, but we know plenty of folks who still make the trip (though we like to fold a visit into a weekend trip to points north). You won’t find penguins, giraffes, or other non-native species at this zoo. What you will find is a tour of sorts of Laos fauna, up and close. It’s important to keep two things in mind when visiting: This is a rehab center and not your typical zoo, so many of these animals have had a hard life (and their appearance reflects this). Also, if you want to maximize your chances of seeing animals, try and avoid visiting in the heat of the day or on a very rainy day. Time Commitment: 90 minute drive (60 km) straight up Route 10; 2 hours at the zoo, including snack time. Nearby Attractions: Tad Xangthevada waterfall/ river complex (see below), Tha Ngon floating restaurants (see above), and points north (e.g. Vang Vieng). 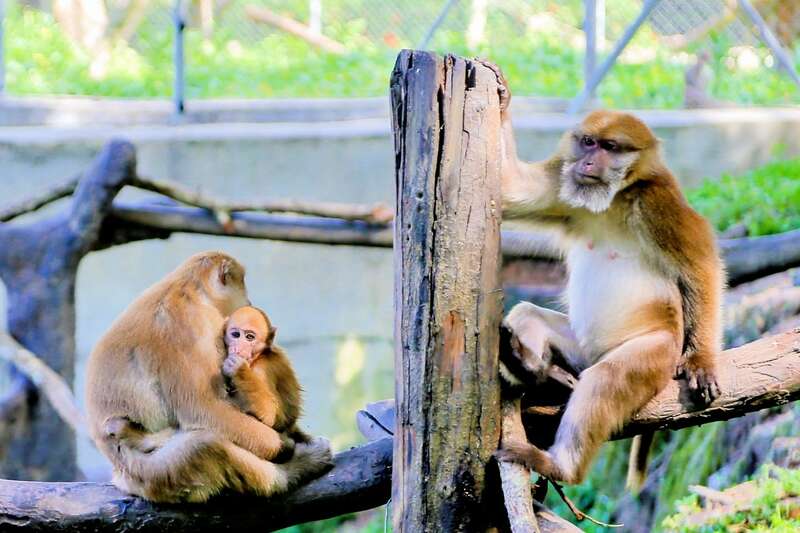 ☞ Read much more in our article, Lao Zoo: The Zoo with a Surprising Secret. 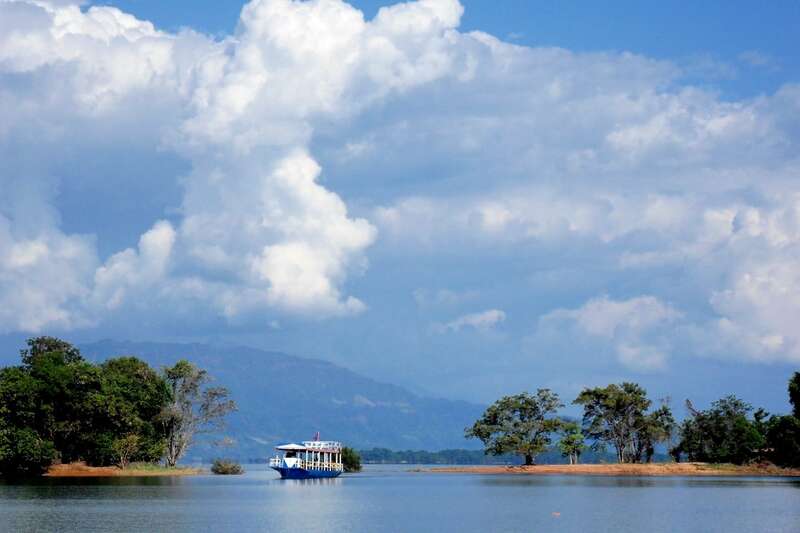 Take a half day boat cruise on the scenic Nam Ngum reservoir. 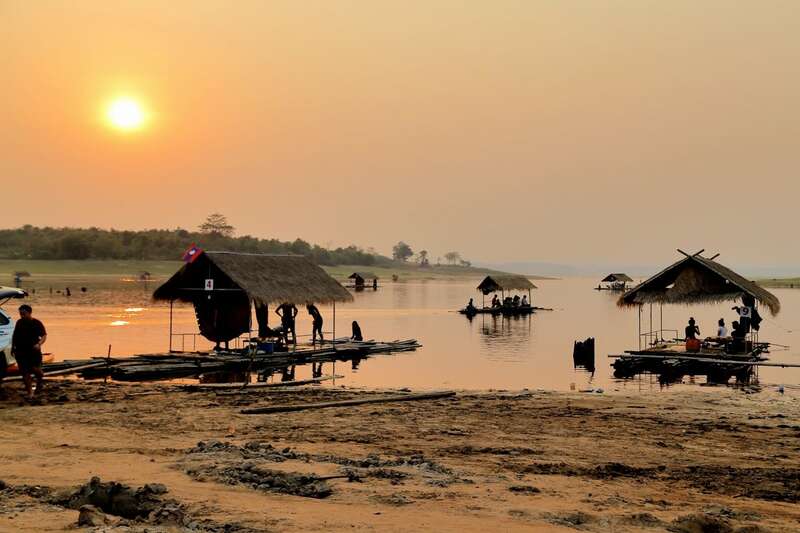 Most boats depart from the small village just south of the Nam Ngum Dam 1 complex. There are also tour agencies in Vientiane that can arrange a day trip for you, such as Green Discovery. Time Commitment: 90-minute drive from Vientiane; One hour cruise plus additional time for lunch and any other activities along the way. Nearby Attractions: Van Sang Buddhas (see below), Nam Ngum 1 hydroelectric dam, points north (Vang Vieng). Day Trips from Vientiane: Lao food on the water, and a sprawling botanical garden. 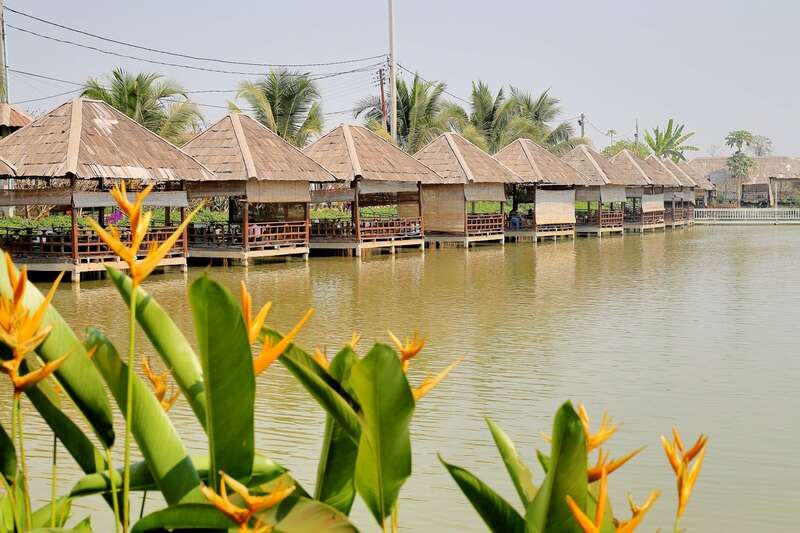 Just a 10 km drive north of the city center, Champa Garden offers delicious Lao food in garden huts set around a manmade lake. It’s the quintessential Lao family weekend experience accessible to anyone. While this restaurant model is quite common around town (and there are certainly similar experiences much closer to the city center), Champa Garden has something you won’t find anywhere else in Vientiane: A sprawling Champa flower garden, complete with water features and viewing platforms! Time Commitment: 30 minute drive (14 km) from city center/ Nam Phou Fountain; 1-2 hours at the grounds, depending on how long you take to explore the flower garden. ☞ Read our helpful article on Champa Garden Restaurant. Vientiane Day Trip: Walking/ hiking/ trail running/ biking Wealth Coffee’s nature trails. It’s no secret that there isn’t a lot of proper nature hiking to be had in this part of Laos. The nature trails at Wealth Coffee are one of the few exceptions. The multi-use trails are popular with hikers, walkers, trail runners, and mountain bikers, and are maintained by Wealth Coffee, an excellent little coffee shop and restaurant right onsite. Grab your favorite caffeinated beverage and hit the trails, then stop for lunch on the way back before heading back to Vientiane. Makes for a great Saturday morning away from the motorbikes and construction that increasingly define Vientiane capital. Time Commitment: 40 minute drive (30 km); 1-2 hours at the property, depending on your pace/activity and whether you choose to dine in at Wealth Coffee. Nearby Attractions: Tad Moun Waterfalls river complex (see below); Phou Phanang Cycle Route (see below); Phou Phanang hiking (see below); Wat Tham Phra (see below). ☞ Read more in our article, Hiking Wealth Coffee Nature Trails. Vientiane Day Trip close to town: Lao Textile Museum. A bit closer to the city center, the Lao Textile Museum complex is a unique living museum and active textile producer. The brainchild of a Japanese transplant, the grounds are peaceful and evocative. Structures are beautiful traditional Lao replicas from a bygone past when Vientiane Lao were more concerned with perfecting their time-honored craft than chasing plastic smart phone dreams. See the old craft of dying and weaving revived and don’t forget to grab a cup of Indigo tea before you leave this oasis of calm and serenity. Time Commitment: 20 minute (6 km) drive from Nam Phou fountain; One hour at the museum. ☞ Read more about our visit to the Lao Textile Museum. For a different kind of day trip from Vientiane, rent a van with a designated driver, load it with friends or family and head up to Central Laos’ flagship rum distillery for an afternoon of local craft rum tasting. LAODI’s pure sugarcane rum is produced in a variety of flavors, something for every taste and palate. Take a tour and see the process from start to finish, then settle down for some tasty sampling. If a day trip doesn’t strike your fancy but you’d still like to sample all of LAODI’s offerings, head on over to Laodi Bar Mekong in the heart of Vientiane’s downtown Mekong Zone for a taste of the regional hooch and some of the best sunsets in town. Time Commitment: 60 minute journey (50 km) from city center; 1-2 hours onsite. ☞ Read more about LAODI distillery at their website. Vientiane Day Trip: Join the locals in quiet contemplation and explore this intriguing temple complex. 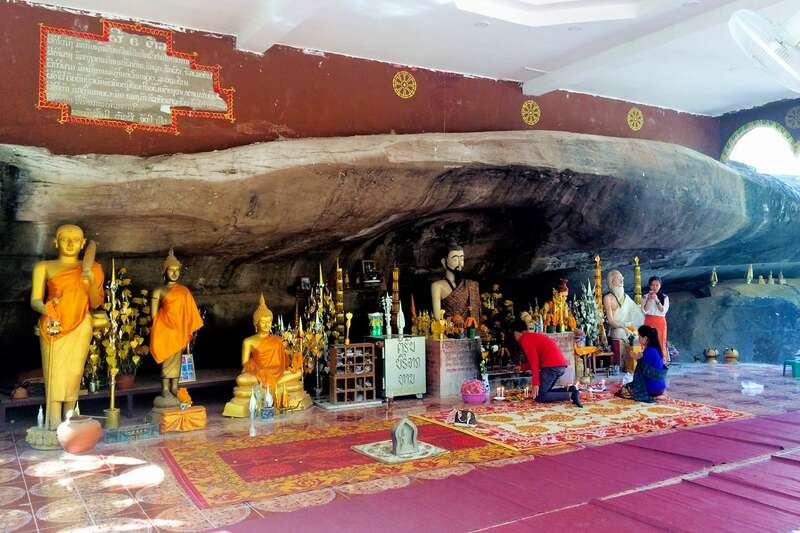 A visit to this unique rock, cave, and temple complex (also called Tham Pha Leusi) just outside of the city is worth for the drive along the Mekong alone. It’s best done, however, with a visit to nearby Wealth Coffee & Nature Trails (see above), or on the way to/from hiking around Phou Phanang National Protected Area and Tad Moun Waterfalls river complex. The temple complex, itself, is a peaceful place set among secondary forest with a small network of walking paths connecting the various parts of the sprawling complex. Please note that this is an active (and sometime popular) place of worship, so please respect worshippers and property, and dress appropriately. Time Commitment: 30 minute (20km) drive from Nam Phou fountain; 30 minutes at the temple. Nearby Attractions: Wealth Coffee & Nature Trails (see above); Phou Phanang Cycle Route (see below); Phou Phanang hiking (see below); Tad Moun Waterfalls river complex (see below). ☞ Read more about our visit to Wat Tham Phra. Day Trips from Vientiane: Lao food on rustic floating huts. 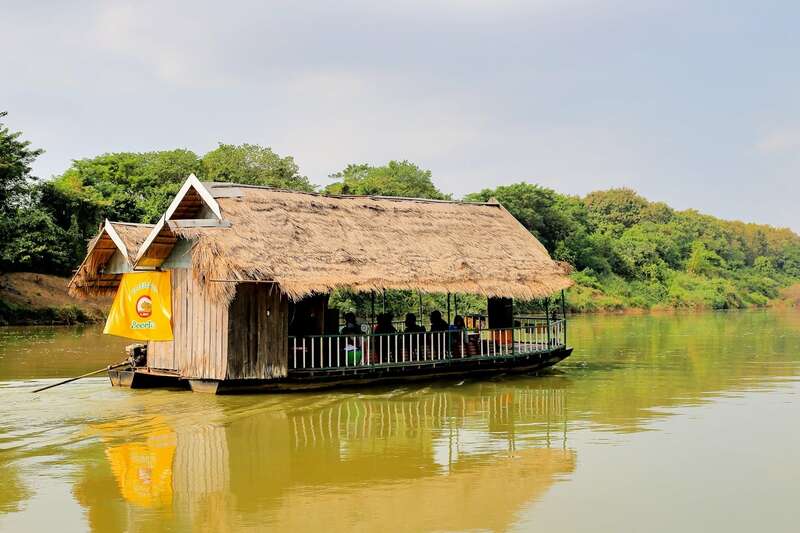 If the thought of enjoying your lunch or dinner with friends or family on the water in Laos intrigues you but you yearn for a more authentic experience than what’s on offer at Champa Garden Restaurant or the floating restaurants at Tha Ngon, then head to the Nam Houm reservoir! The beach at Angnamhoum Village (across the water from Lao Lake House) has more than twenty covered floating huts made of bamboo and reed. A number of these can be untied and driven around the inlet (with the help of a boat driver with long-tail motor that can be hired onsite). Order at the large restaurant hut at the top of the hill, give them the number of your hut, and as soon as your food comes, head out on the lake. This place is very popular with locals on the weekends, so arrive early to secure a floating hut. Time Commitment: 60 minute (35 km) drive up Route 13 North from Nam Phou fountain; 30+ minutes on the lake. Nearby Attractions: Lao Lake House (if looking for excellent nearby lodging on the lake); Nice stop on the way to/from points north (Vang Vieng, Nam Lik Eco Village, Lak 52 (KM 52 Hmong village – see below), Vang Sang Buddhas). 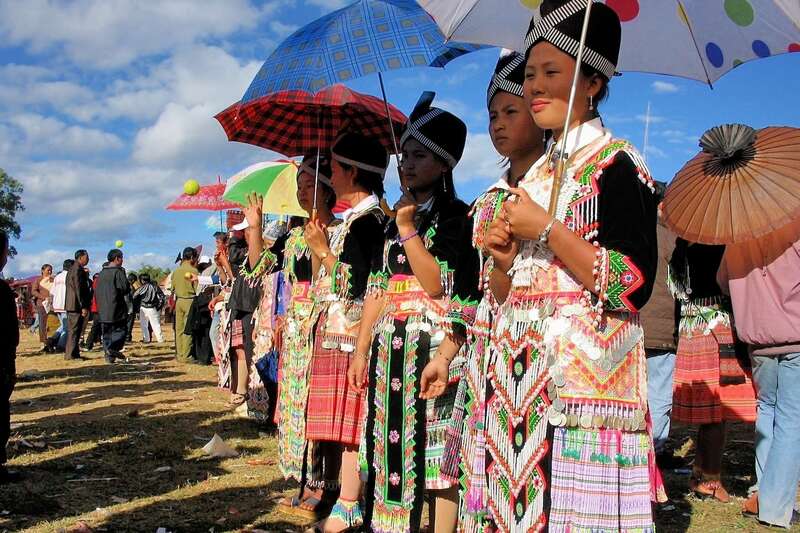 Hmong wedding in Laos (Oliver Spalt / Wikimedia Commons). 52 kilometers up Route 13 North, visitors have a unique opportunity in the capital region to explore a Hmong ethnic village, meet weavers and musicians from this ethnic group with a fascinating and bittersweet history, purchase handicrafts straight from the community, and participate in Hmong festivals (namely the Hmong New Year festival, which falls between late November and early December each year). There are homestays available and some residents even offer accommodation on CouchSurfing.com. Time Commitment: 90 minutes (50km) driving from city center; 30-60 minutes to walk around the village, longer if you plan to stay overnight or are around during festival time. Nearby Attractions: Vang Sang Buddhas; Points north (Vang Vieng, etc.). Day Trips from Vientiane: Cycling along the Mekong in rural Vientiane Prefecture. If being active outdoors is more your style, area cycle clubs offer regular rides from Vientiane, west along the Mekong. This route has the unique distinction in the capital region of being both well-maintained and not a major highway to anywhere — perfect for cycling. 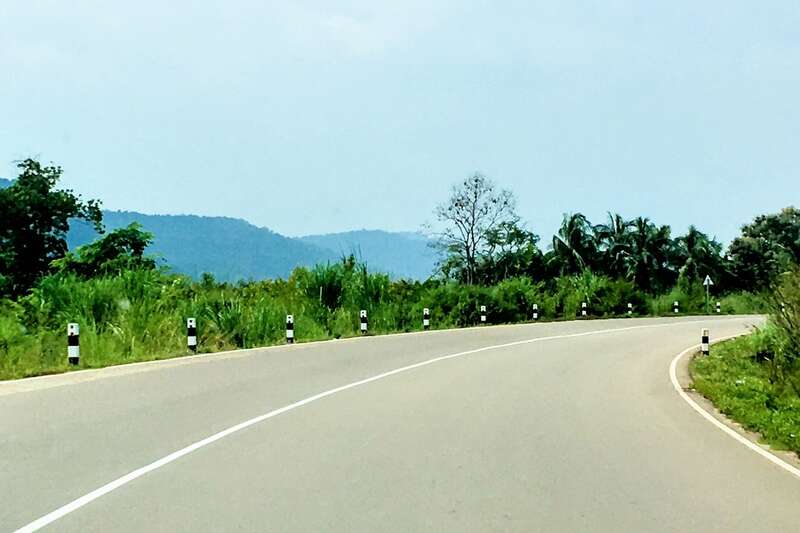 If you’re visiting for a short time and don’t have your own wheels, Green Discovery (greendiscoverylaos.com) offers package tours along this route. You can also rent a bike in town and do the route on your own. However, the more scenic part of the ride begins several kilometers out of town, so you’ll likely want to get your hands on a swift and lightweight road bike for this excursion. Alternatively, this activity can be done with a motorbike, and there are several places you can rent one in town for the day for cheap. Time Commitment: Completely dependent on your time allocation, ability, and bicycle, but 1-3 hours would likely be sufficient for most riders, particularly if you want to avoid riding in the heat of the day. Nearby Attractions: Wealth Coffee & Nature Trails (see above); Wat Tham Phra (see above); Tad Moun Waterfalls river complex (see below). Vientiane Day Trip: Cool off like a local and enjoy Lao food at this waterfall complex. 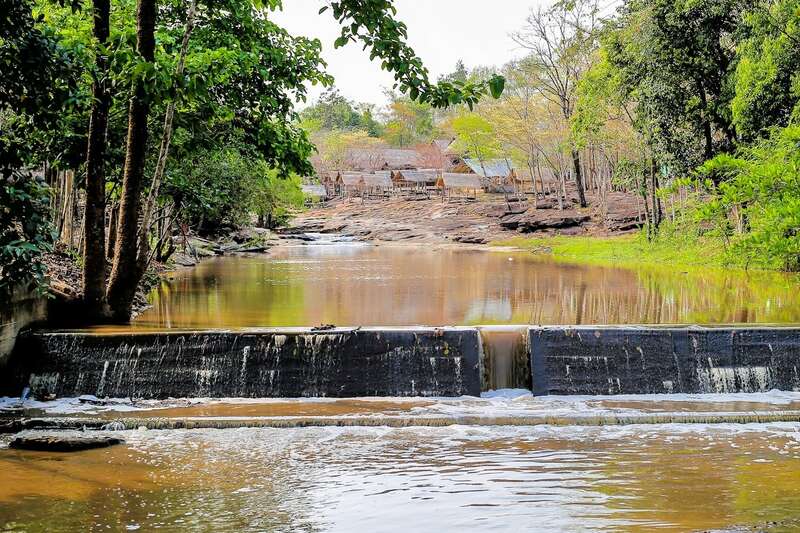 This natural water complex along the Phou Phanang protected area access road can be hit or miss, but a visit in September-December will increase your chances of encountering clean, running water and fully-functioning restaurants. While the “waterfall” here is little more than a set of gentle rapids, it can be a nice place to cool off on a hot day, depending on the season. 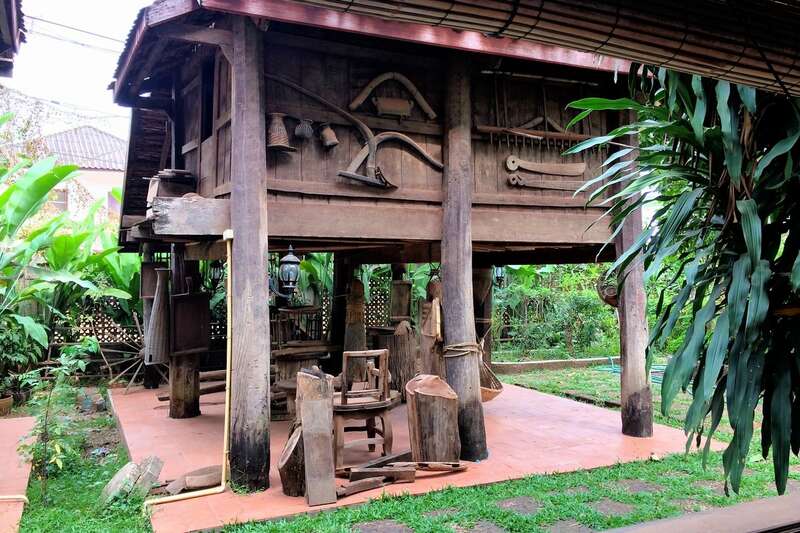 There are a number of rustic huts here with local food, but you can also bring your own and have a picnic in one of the huts along the river for the price of a soda or BeerLao. Time Commitment: 45 minutes (20km) drive from city center; 30 minutes to a couple of hours, depending on how much eating and swimming you plan to do. Nearby Attractions: Hiking the national protected area (see below); A round of golf at the Mekong Golf & Resort. Day Trips from Vientiane: Do an independent hike around a national protected area. One of the few independent hikes in the region, this one exists only because of a handful of intrepid expats who wanted a rural hike close to town. This six-mile (10km) loop won’t win any awards for world’s best hike. Still, it’s time well spent in the Laos countryside and secondary forests of this protected area. Park at the Tad Moun Waterfalls complex (see above). There may be a small fee if there is an attendant on duty. Time Commitment: 45 minutes (20km) drive from city center; 2-3 hours for the hike. Nearby Attractions: Tad Moun waterfall complex (see above); A round of golf at the Mekong Golf & Resort. 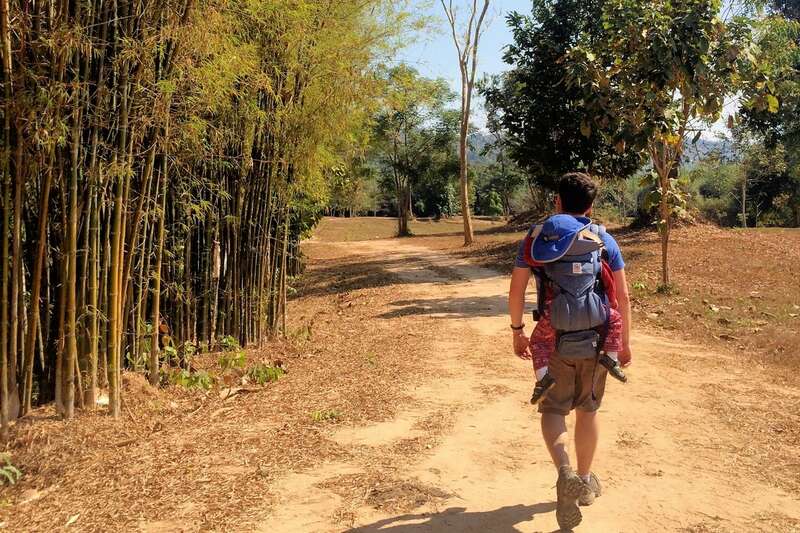 ☞ Read all about this hike in our helpful article, Hiking Phou Phanang. Vientiane Day Trip: Visit an organic farm. 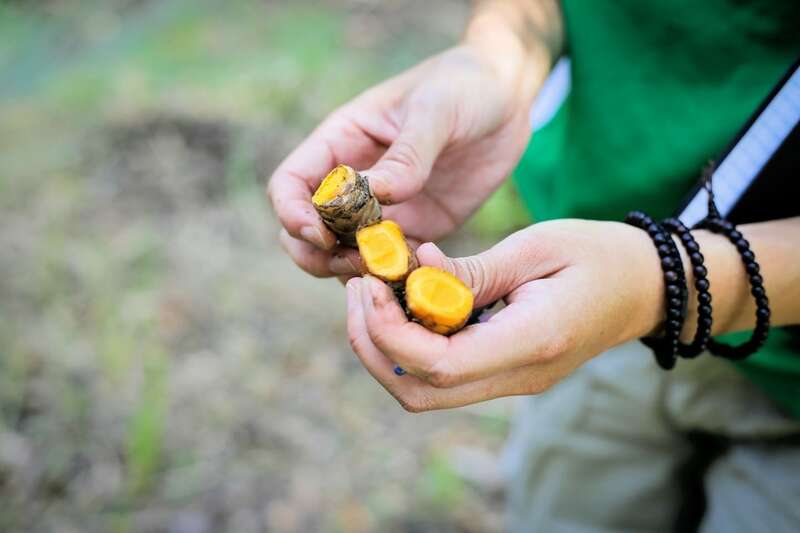 A trip to one of Vientiane area’s growing number of organic farms can be a fun way to spend some time in the countryside and see farm operations in action. Many of the area’s organic farms, in particular, are open to the public on certain days of the week or for special events. We visited Agro Asie during an open house event, but Panyanivej Farm and Phutawen Farm have regular visiting days and hours (though you might need to contact them ahead of time to confirm and/or make an appointment). Panyanivej is the closest to the city center and offers visitors hands-on experiences with Lao farming techniques, planting, fishing, harvesting, and more, depending on the season. Time Commitment: Varies, depending on the location and activities available. Vientiane Day Trip: Chill out like a local on a hot day. 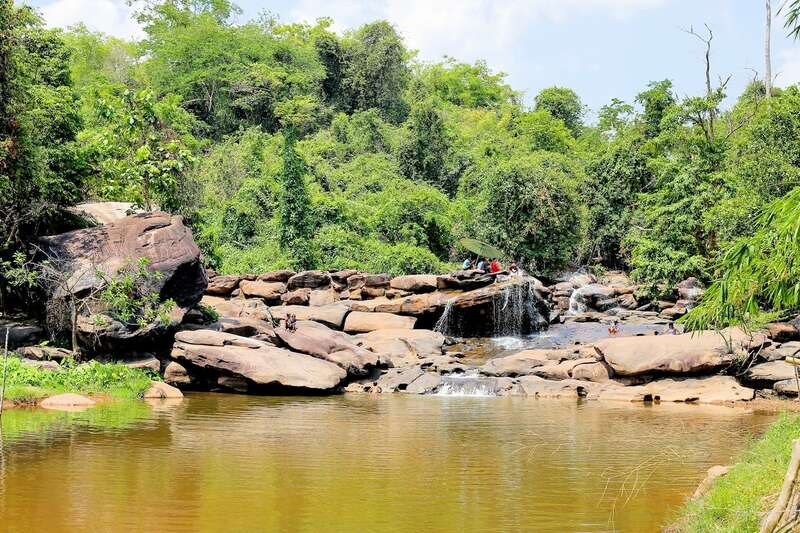 Like Tad Moun west of Vientiane, Tad Xangthevada is a favorite destination northeast of the capital offering natural water features, areas for relaxation, and local food. However, Tad Xangthevada is a bit more developed with a larger waterfall (in the wet season) and a few more activities (like paddle boating), and as a result, tends to attract larger crowds. 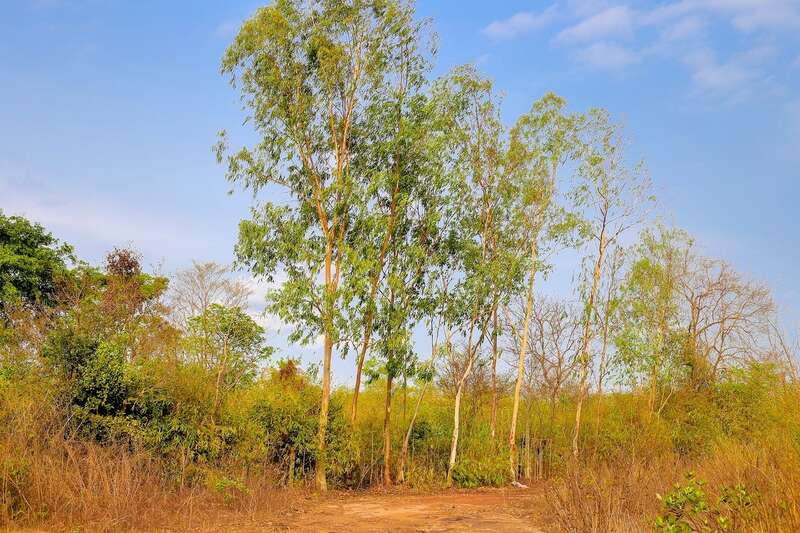 While Tad Xangthevada is on the edge of Phou Khao Khouay protected area, it is on the very far western edge of the reserve, and there is no easy access to eastern part which is more popular with foreign tourists. Time Commitment: 90 minutes (60 km) drive from city center; Pop in for 30 minutes, or stay for most of the day, it’s up to you. Nearby Attractions: Lao Zoo (see above), Dansavanh Nam Ngum Resort & Casino. There are several vocational training centers for women in Vientiane, but none quite like Houey Hong. Tour the facility and see textile weaving and natural dye technique training in action. Or, sign up for a half-day or full-day workshop and learn how to weave and dye yourself! Time Commitment: 25 minutes (8 km) driving from city center; 30-60 minutes for tour, half-day or full-day for workshops. Nearby Attractions: Lao Textile Museum (see above). ☞ More information about visiting and workshops can be found at Houey Hong’s website. No doubt, there are numerous places to cool off on a hot day in and around Vientiane. If manmade waterparks and cold beer are more your thing, head over to Inpeng Culture Park near the Thai-Lao Friendship Bridge. To be honest, there’s not a lot of “culture” on display at this Culture Park, unless you count the crowds of local kids jockeying to use the various waterslides and pool toys while their parents sip on glasses of beer and ice on a sunny Saturday. If you are traveling with kids or are simply looking for a place to cool off on your way to or from Buddha Park or Nong Khai, Thailand, Inpeng might just be what you’re pining for. Time Commitment: 40 minute drive from city center; 1-3 hours at the park, depending on your commitment to water activities and poolside lounging. Nearby Attractions: Buddha Park (see above); Lao Disabled Women’s Development Centre (local handicrafts, learning); Thai-Lao Friendship Bridge (convenient for those heading on to Thailand). Hidden in the woods in Vientiane Province is a mysterious group of Buddha image sculptures carved into rock. Some of the statues are 10 feet high (3 meters) and are believed to date back to between the 10th and 16th century. This is not a highly-trafficked tourist sight by any stretch, and half the adventure of the Vang Sang Buddhas is setting out with this knowledge and actually finding them. Time Commitment: 1 hour 45 minutes (70 km) drive from city center; 30-60 minutes at the site. ☞ Read this Atlas Obscura article for more on the site, including driving directions. What list of Vientiane Day Trips would be complete without Phou Khao Khouay on the list? Honestly, I was a bit hesitant to put Central Laos’ beloved national protected area on this because getting there and back (at least to the eastern part of the park where most of the tour operators head to) makes for one heck of a day trip. That’s not to say it’s a bad idea to do it in a day trip, but know that it can be quite the full day. The park boasts some of the best forest walks, waterfalls, wildlife viewing, and rural village experiences in Central Laos. Sadly, however, elephants (once the park’s key feature) have not roamed the park freely in a decade. While Phou Khao Khouay can be done on your own, this is one trip that is best done with an organized tour, particularly if you’re looking to make a day trip out of it. There are several good operators that do these trips out of Vientiane, but Green Discovery is reputed to be one of the best. Many of the sights and destinations mentioned here are most easily accessed using your own vehicle or rental car if you have access to one. Apart from the usual international rental chains at Wattay International Airport, there are a few local rental companies (and many motorbike rental shops) scattered across downtown. Enquire at your guesthouse or hotel for the best information. That’s not to say that you need your own vehicle to visit the majority of these locations. Some, like Buddha Park and Inpeng Culture, can be accessed easily using public buses (read our Buddha Park article for taking the #14 bus to Buddha Park). While many visitors feel inclined to hire a tuk tuk for a half or full day as part of the experience, tuk tuks are almost always much more expensive than hiring a taxi or even a minivan, and always slower for out-of-town trips. During the rainy season, safety and comfort decrease dramatically with a tuk-tuk on a long trip. Hiring a taxi is best done through your hotel or guesthouse, as taxis are not marked in Vientiane and rarely pick up passengers on the side of the road. Here at AwayGoWe, we love figuring out how to do travel independently, and tend to shy away from organized tours. With that said, because of the lack of public infrastructure and long distances to some of these sights, travelers stand to get a lot more value for their money joining an organized tour in Laos than they might in other countries such as Thailand or Vietnam. There are a number of reputable companies in Vientiane, but the two we are able to personally recommend are Green Discovery (greendiscoverylaos.com) and Tiger Trail (laos-adventures.com), two of the oldest and most trusted outlets in the country. ☞ For more Vientiane transport tips, read our article, How to Get To and Around Vientiane. Have you taken a day trip from Vientiane? What did we miss? Tell us what you think in the comments below.